BRIDGEPORT, Conn. — A gun manufacturer should be held accountable for selling the public semi-automatic rifles that were designed as military killing machines, a lawyer for families of some victims of the Sandy Hook Elementary School massacre told a judge Monday. The argument came during a court hearing on Remington Arms' request to dismiss a lawsuit by relatives of nine children and adults killed at the Newtown school on Dec. 14, 2012, and a teacher who survived the shooting. A total of 20 first-graders and six adults were fatally shot with a Bushmaster rifle made by Remington. Judge Barbara Bellis, who rebuffed a similar request by Remington and other defendants in April, did not rule Monday. The arguments were made on the same day the U.S. Supreme Court rejected challenges to assault weapons bans and other gun control laws passed in Connecticut and New York in response to the Sandy Hook killings. Also Monday, the U.S. Senate was taking up gun control measures a week after 49 people were killed with a similar rifle in Orlando, Florida. The Orlando killings have reignited debates over AR-15-style rifles, which have been used in several mass killings in recent years, and over whether to reinstate a federal assault weapons ban that expired in 2004. There has also been renewed debate, including among presidential candidates, over whether to repeal a 2005 federal law that shields gun manufacturers from most lawsuits over criminal use of their products, with some exceptions. Besides Remington, other defendants in the Connecticut state court lawsuit include firearms distributor Camfour and Riverview Gun Sales, the now-closed East Windsor store where the Newtown gunman's mother bought the Bushmaster XM15-E2S rifle used in the shooting. James Vogts, a lawyer for Madison, North Carolina-based Remington, told Bellis on Monday that the lawsuit should be thrown out on several technical grounds, including the 2005 federal law — the Protection of Lawful Commerce in Arms Act. Vogts said the rifle used in Newtown was legally made by Remington, legally distributed by Camfour and legally sold by Riverview Gun Sales to Nancy Lanza. Her 20-year-old son, Adam Lanza, shot her to death at their Newtown home before driving to the school, where he killed himself as police arrived. When asked by Bellis whether the Remington lawsuit was based on similar legal grounds as lawsuits against cigarette manufacturers, Vogts said that lawmakers need to set gun policy and that the gun industry is heavily regulated. "A personal injury case in front of a jury is not the place for a new policy to emerge on who should own firearms and what type of firearms,'' he said. 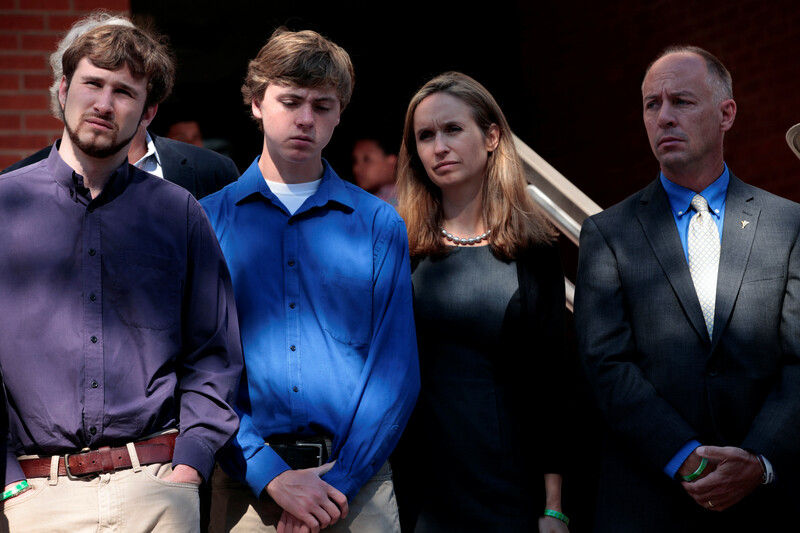 Joshua Koskoff, a lawyer for the Newtown victims' families, argued the lawsuit is allowed under a "negligent entrustment'' exception to the 2005 law and the Connecticut Unfair Trade Practices Act. The exception was designed for cases such as when a gun store sells to someone who is obviously intoxicated or threatening to kill someone. Koskoff said civilian AR-15-style rifles, which fire one bullet with each trigger pull, are virtually the same as the U.S. military's M-16 rifles, which can be set to fire more than one round with each trigger pull. "It was Remington's choice to entrust the most notorious military American killing machine to the public and to continue doing so in the face of mounting evidence of its association with mass murder of innocent civilians,'' Koskoff told the judge. Mathew Soto, brother of Victoria Soto, a teacher who died in the Newtown shooting, said Monday outside the courthouse that the Orlando shooting brought back horrible feelings from the day his sister was killed.